India News, known for its direct and unbiased brand of journalism, is all set to host a special conclave Manch – Modi Sarkar, Kitni Asardaar? (How Effective Has the Modi Government Been?) in New Delhi on Friday, May 25, 2018. The day-long event will present a comprehensive overview of the BJP government at the Centre as it completes four years in power under the leadership of Prime Minister Narendra Modi. The event will be telecast live on India News and NewsX starting 10.00 a.m. Spread over a day, the conclave will feature top political leaders and ministers from the Modi cabinet, government officials and members from the opposition. Besides political leaders, the event will be attended by bureaucrats, economists, leading journalists, corporates and esteemed members of the civil society. The conclave will feature Special one-on-one interviews and panel discussions with Shri Nitin Gadkari, Hon’ble Minister of Road Transport and Highways, Shri Piyush Goyal, Hon’ble Minister of Railways and Coal, Shri Rajyavardhan Singh Rathore, Hon’ble Minister of Information and Technology, Shri Prakash Javdekar, Hon’ble Minister of Human Resource Development, Dr. Jitendra Singh, MoS, PMO, Shri Subramanian Swamy, Hon’ble Member of Parliament, Shri Randeep Surjewala, In-charge, Communications, AICC, Shri RPN Singh, Spokesperson, AICC, and other prominent politicians and leaders. 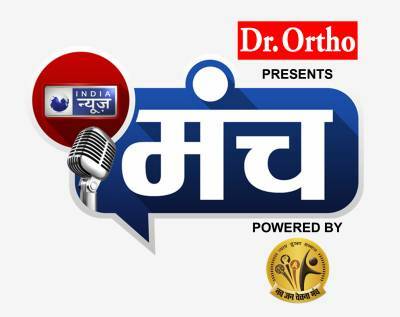 Manch is an India News initiative to foster a sense of citizenship and make political processes more transparent and accountable towards the people of the country. The event in New Delhi will be marked by multiple panel discussions and one-on-ones that sought to address several key issues including Law and Order, Development and Infrastructure, Health and Education, Youth Welfare and Employment, Women Safety and Agriculture.